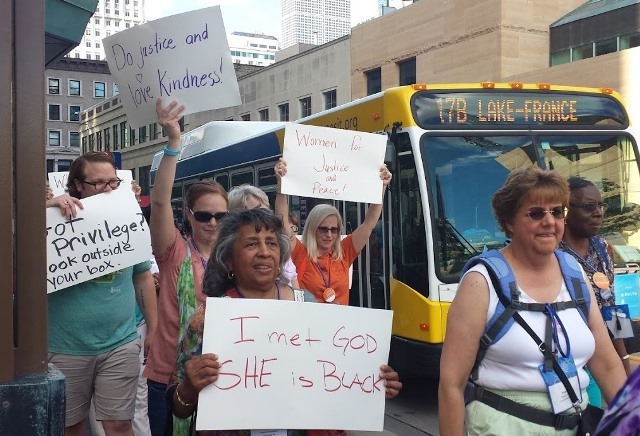 Presbyterian Women stand as silent witnesses and march for justice and peace in Minneapolis. 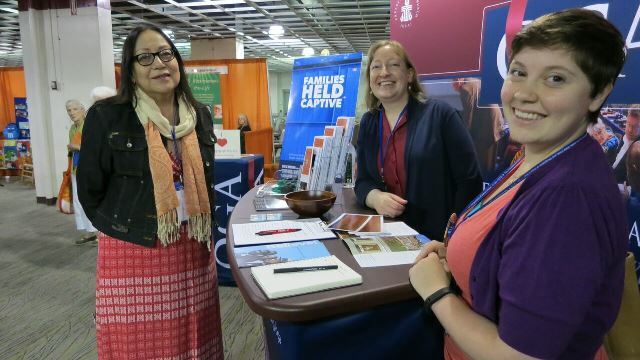 Last month I was lucky enough to travel to Minneapolis, MN, to represent the Presbyterian Historical Society at the triennial Churchwide Gathering of Presbyterian Women. As a new employee at PHS, I looked forward to learning about PW firsthand. 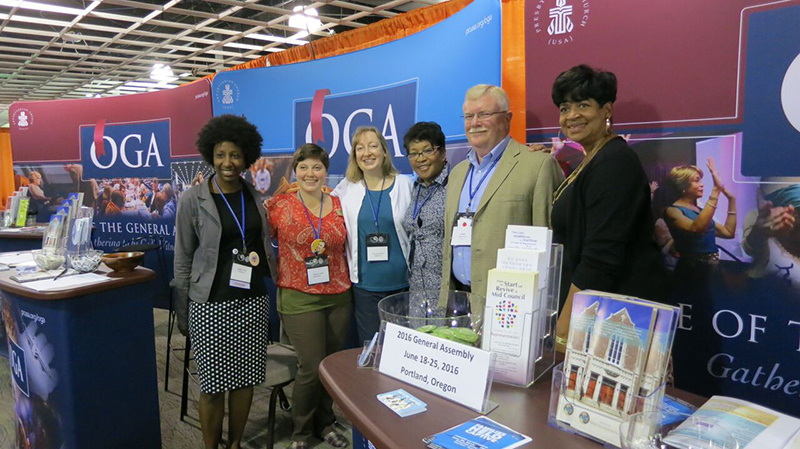 At the OGA booth, I joined my PHS colleagues Lisa Jacobson and Beth Hessel, as well as other representatives from the Office of the General Assembly. Throughout the Gathering we spoke with many wonderful women who had invested terrific amounts of time and energy toward PW efforts within their own congregations—work done in addition to their full-time jobs. 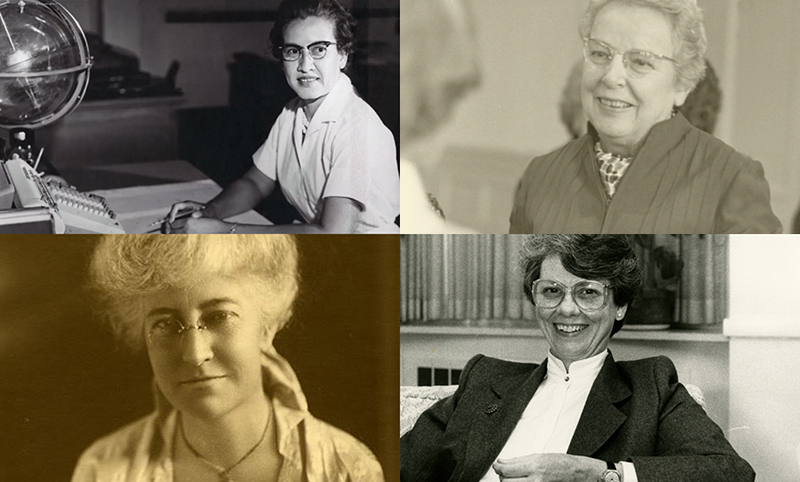 Many had made it their mission to raise daughters in the strong Presbyterian Women tradition. Their love of God and community was admirable; their focus on social justice inspiring. The Office of the General Assembly at PW. The Rev. Fern Cloud is an example of just such a woman. A pastor at Pejuhutazizi Presbyterian Church in Yellow Medicine County, MN, she graciously took time from her schedule to film a Living History interview about the challenges and opportunities of pastoring on a reservation. Keep an eye out for that video, which we will be posting online later in the year! Left to right: Fern Cloud, Lisa Jacobson, and me. I returned from the Gathering with a better understanding of what PW is. But I began to wonder about the was—particularly the history of women’s organizations within the church. Using PW's website and the collections at PHS, I located a variety of sources that together painted a time-lapse picture of these groups. Women have been gathering in their churches for prayer, bible studies, and community service for centuries. PHS’s shelves are filled with the minutes of Ladies Aid Societies, Young Women Mission Circles, Women’s Service Guilds, and Ladies Community Circles, some over 200 years old. In the late 1800s, while women were organizing and supporting their local communities and foreign missions at the congregational level, their official roles grew stronger within the national Presbyterian denominations. In 1875, Mrs. Sarah Foster Hanna, a “missionary enthusiast” and principal of Washington Female Seminary in Washington, PA, became the first woman to be invited to speak at the United Presbyterian Church of North America’s General Assembly. There, her suggestion that women’s missionary societies be joined in presbyterials was approved. A committee was formed and within a year seventy societies were recognized. By 1885, the General Assembly had approved the formation of the Women’s General Missionary Society. The Society’s success raising funds to pay for the salaries of ten single women missionaries led to continued growth for women’s organizations within the denomination. Only ten years later, the salaries of fifty-six women missionaries at home and abroad were supported by WGMS. In the Presbyterian Church in the United States (the Southern branch of the church), women’s groups were quick to join Women of the Church after its 1912 founding. By 1953, 3,086 Women of the Church groups and 56,395 individual members were serving the church as leaders through that body. In the audio recording below from the 1953 General Assembly, the Board of Women’s Work provides a general description of Women of the Church members. In the same recording, the Board of Women’s Work discusses how Women of the Church operates within the church and the General Assembly. In 1988, five years after the Presbyterian Church (U.S.A.) was formed from the union of the Presbyterian Church in the United States with the United Presbyterian Church in the U.S.A. (the Northern branch), Women of the Church and United Presbyterian Women joined forces to become the thriving Presbyterian Women organization I enjoyed learning about in Minnesota. On my last night in Minneapolis, dozens from the Gathering marched through downtown chanting for justice and peace. That moment was the most inspiring for me—three generations of women raising a shared voice for what was right and good. Their signs quoted bible verses and supported a variety of causes including “Black Lives Matter,” the living wage, and women’s rights. Their march ended back at the Gathering venue, where they concluded with a silent stand-in for justice. This kind of demonstration brought to light why women's groups were formed centuries ago: the members understood that they could do more as a group than they could individually. What was true then is true today, for women and men from across the Presbyterian community. Presbyterian Women march through downtown Minneapolis. 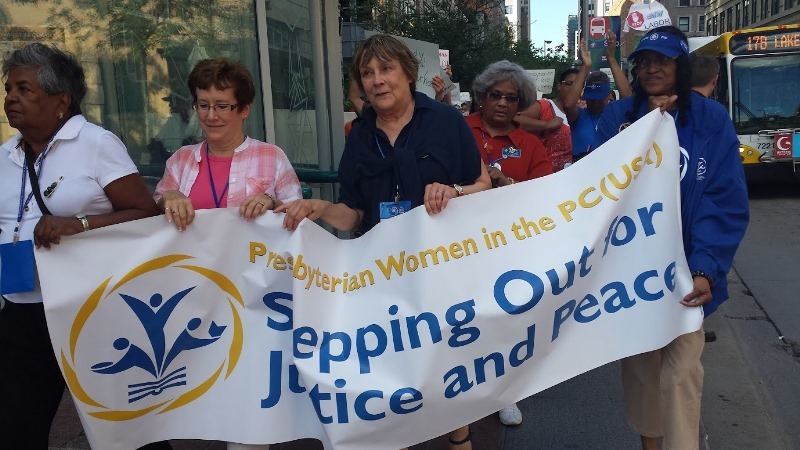 Presbyterian Women march for justice and peace.